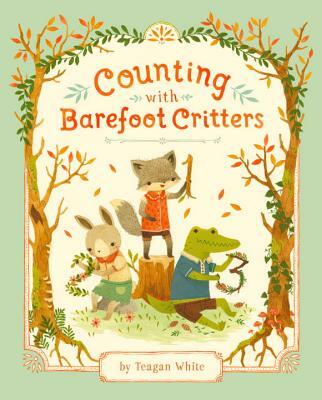 What is a day of counting with Barefoot Critters? TEAGAN WHITE is a freelance designer and illustrator from Chicago, now living and working in Minnesota, where she earned her BFA in Illustration from the Minneapolis College of Art & Design. Her work encompasses intricate drawings of flora and fauna, playful watercolors of anthropomorphic critters, illustrated typography, and everything in between. Teagan lives in the woods across the street from train tracks and a fox den, and spends her free time scolding neighborhood squirrels, exploring forests, rivers, lakes, and swamps, picking wildflowers, and collecting animal bones. This is her second book featuring the Barefoot Critters - Adventures with Barefoot Critters was her first picture book. The author lives in St Paul, Minnesota.